The conifers are a group of about 588 species of trees and shrubs that include many of the best-known plants in the world. All conifers bear seeds inside cones, woody protective structures. There are seven families of conifers. The largest is the Pine family (232 species), which includes such familiar trees as pine, spruce, fir, and larch. Most plants in this family have needlelike foliage and bear their seeds in a cone formed of papery or woody scales whorled about a central axis. The Pine family includes the oldest known trees, the bristlecone pines, many of which are known to be more than four thousand years old. The next largest family (147 species) is the Podocarps. Most Podocarps are tropical trees, many of them native to the Southern Hemisphere. Generally, they have broad leaves and bear their seeds in a structure similar to a berry. Nonetheless, their flowers, the anatomy of their wood, and the details of seed development all show that Podocarps are closely related to the Cypress family (141 species). Most trees in the Cypress family bear scalelike foliage and have cones that have only a few scales. Besides cypress, this diverse family includes juniper, a common tree or shrub in desert areas; giant sequoia, which is the world's largest tree; and coast redwood, the tallest tree in the world. The remaining 68 species of conifers include a wide variety of less well-known trees, such as the yews, which are common garden plants, and the araucarias, which are important timber trees in some tropical countries. Although the 588 species of conifers are not a very abundant group compared with the 250,000 species of flowering plants, the conifers are ecologically and economically one of the most important plant groups. A few species in the Pine family form the most extensive forest on Earth, the boreal forest, which covers thousands of miles across Russia, Canada, and Scandinavia. One species, the Siberian larch, is the most numerous and widespread of all trees. 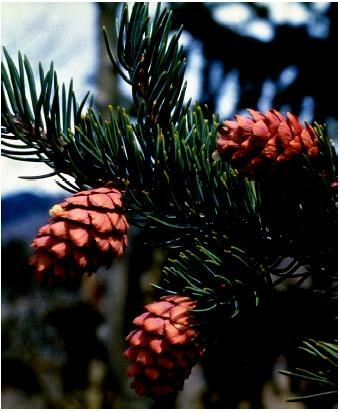 All conifers bear seeds inside cones, woody protective structures. source of many important organic chemicals used to make paint and other finishes, solvents, and oils used by industry. Native peoples have used conifers to make houses and necessary implements, and some peoples have even used them for clothing (from woven bark) and food (seeds). Conifers are one of the oldest groups of plants, with araucaria-like trees first appearing about 290 million years ago, and primitive representatives of most of the conifer families appearing during the Mesozoic era, from 230 to 68 million years ago. Therefore, conifers, and other types of gymnosperms , are generally regarded as being more evolutionarily primitive than angiosperms. Dallimore, William, Albert Bruce Jackson, and S. G. Harrison. A Handbook of Coniferae and Ginkgoaceae, 4th ed. New York: St. Martin's Press, 1967. Earle, C. J. The Gymnosperm Database. <http://www.conifers.org> . van Gelderen, D. M., and J. R. P. van Hoey Smith. Conifers, 2nd ed. Portland: Timber Press, 1986.